The Rum Runner was created in the 1950's at the Tiki Bar of Holiday Isle in Islamorada, Florida. It's popular drink, filled with fruits and rum. It can either be shaken or blended and no matter how you decide to mix up your Rum Runner, it is a delicious tiki cocktail. As we often see with tropical drinks, it seems like there are a million ways to make the same cocktail and rarely do two recipes agree. The Rum Runner is no exception though there are a few elements that most (certainly not all) recipes do agree on: rum and banana and blackberry liqueurs, and grenadine. From there, we see can pineapple or orange juices (or both), one or two rums (sometimes spiced or coconut), and the occasional use of falernum, among other things. For this reason, I've included three of my favorite Rum Runner recipes. They are each unique, and you may find that you enjoy one more than the others. It doesn't matter which Rum Runner is 'original' or 'the best,' because the journey in finding your perfect Rum Runner recipe is half the fun! This Rum Runner recipe may have one of the longest ingredient lists, but notice that each is poured equally. That makes it an easy drink to remember and make! Two styles of rum are used in this recipe, which adds a nice foundation for all the fruits. Some drinkers may prefer to use a spiced rum rather than a dark and others may like a coconut rum like Malibu instead of a light rum. Shake well and strain into a hurricane glass over fresh ice. If you're throwing a party, set all of these ingredients out on the bar counter and simply pour 1 shot from each bottle (except the grenadine). It makes serving this Rum Runner super easy! Make this rum runner a blended beverage by pouring the ingredients into a blender with about 3/4 cup of ice and blending until smooth. Whether or not you enjoy this Rum Runner recipe more is going to depend on your taste for orange juice. That is the dominant flavor of this drink as it outweighs all of the other ingredients combined. You might think of this as a rum take on the Tequila Sunrise. It is a nice drink, though. The rum, blackberry brandy, and banana liqueur nicely complement the fresh orange, and their sweetness offsets the tart citrus. I also enjoy this recipe because it's super easy and requires far fewer ingredients. Try it in the blender as well; it makes a fantastic frozen drink! 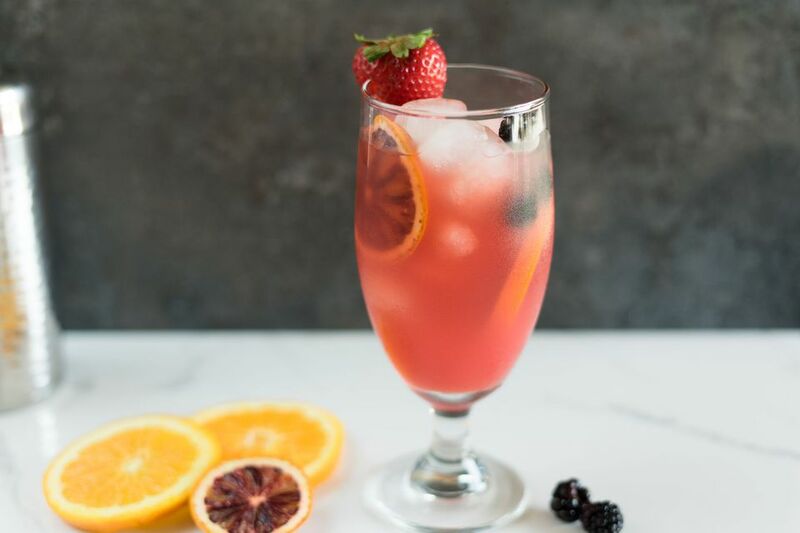 To make this drink, combine 1 1/2 ounces rum with 1/2 ounce each blackberry brandy and crème de banana with 3 ounces orange juice in a cocktail shaker filled with ice. Add a dash of falernum, shake, and strain into a chilled hurricane glass. Tip: If you cannot find falernum - an almond, ginger, lime, and spiced sugar syrup - that is used in many rum cocktails, use grenadine instead. If you do not own a copy of Dale DeGroff's The Craft of the Cocktail, you are missing out on great recipes like this Rum Runner. It is completely different than all others, but that's what makes it so great! You will find that DeGroff's recipe is decidedly lighter because it skips the heaviness of orange juice and opts for refreshing pineapple instead. It also features two rums - of which I recommend choosing wisely and use the 'good stuff' - and brings in that rich texture of an egg white. All of these elements give DeGroff's Rum Runner a classic style that is untouched in most modern renditions of this cocktail. Whip this version up when you want to impress your guests. To make this drink, muddle a piece of lime in the bottom of a cocktail shaker, so it is lightly bruised. Add 1 ounce each light and medium rums, pineapple juice, and simple syrup as well as 1/2 ounce lime juice and an egg white. Shake vigorously (more than usual to properly mix the egg) and strain into a tall glass with ice. Garnish with tropical fruit. How Strong Are the Rum Runner Cocktails? Rum-filled tiki cocktails are not known to be the lightest drinks though they will be as strong as you want to make them. If you pour stronger rum or use less juice, you will naturally get a stronger drink. What's the difference? The first recipe uses an equal amount of everything and includes two rums with two liqueurs. The juices in the other recipes make up most of the volume and bring the drinks' potency down significantly.